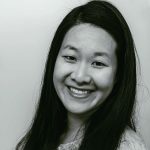 Published Apr 17, 2018 By Julia 49 CommentsThis post may contain affiliate links. 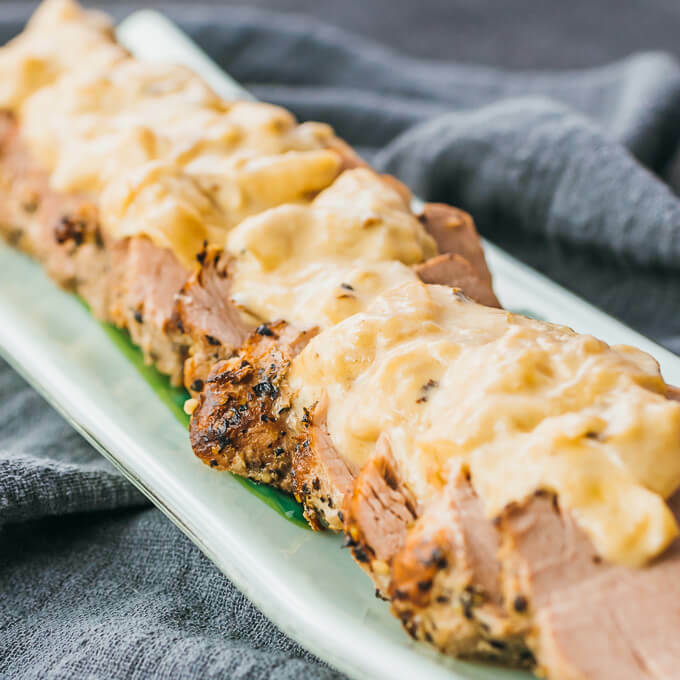 An easy pressure cooker recipe for Instant Pot Pork Tenderloin served with a creamy mustard sauce and onions. Low carb, keto, and gluten free. I love making roasted pork tenderloin, but it usually requires both the oven and the stove top, as well as a minimum of two pieces of cookware. 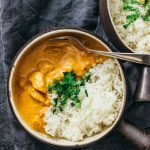 Looking for an easier solution, I decided to turn to my Instant Pot. 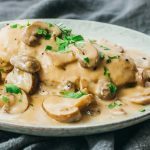 With the Instant Pot, just a single pot is used for sauteing the tenderloin, pressure cooking, and simmering the gravy sauce. Cleanup is much easier. 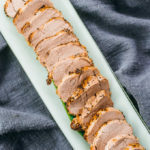 Just like the roasted version, pressure cooked pork tenderloin is juicy and tender, and makes for a fabulous main entree. You can pair with a side of greens or vegetables like Instant Pot Green Beans and Instant Pot Brussels Sprouts. Pork tenderloin is best when cooked until just medium rare (145 F) and no more. This temperature refers to the center of the thickest part of the tenderloin. Ideally, you’ll want to cook the pork to 140-145 F and let carryover cooking finish it off. You’ll be well-rewarded with incredibly tender meat. I’ve tested various methods of cooking tenderloin in the pressure cooker, experimenting with different lengths of time for pressure cooking and natural release. The best combination is a 4 minute pressure cooking time followed by a full 10 minutes natural release, assuming you are sauteing the pork beforehand. This works for tenderloins ranging in weight from 1 to 1.5 pounds. Pork tenderloin is not the same thing as pork loin. They’re from different parts of the pig and look very different from each other. Pork tenderloin is small, thin, and long, whereas pork loin is a large and wide cut (like steak size). More info here. I’ve used pork tenderloins purchased from Trader Joe’s and Costco. Trader Joe’s has both unseasoned and a seasoned variety (garlic-peppercorn), either will work for this recipe. My local Costco has a great deal for pork tenderloin where you can get a pack of 4 tenderloins. You can use one for this recipe and freeze the rest for later. Use an instant-read thermometer. After a 10 minute natural release, the thickest part of the tenderloin should be about 140 to 145 F. As it rests, its temperature will continue to rise during carryover cooking. Pork tenderloins can vary a bit in size and shape, so if you don’t use a thermometer, you’ll just be guessing whether it’s cooked through or not. If the pork tenderloin is less than 140 F after 10 minutes of natural release, add it back to the pot when the liquid is boiling during the sauce thickening step. It’ll be done once it reaches 145 F.
Leftovers can be covered and stored in the refrigerator, ideally used within a few days. I typically reheat the pork in the microwave for ease of use, but it can be hit-or-miss. Most of the time it reheats well, but occasionally I get a tenderloin slice that’s a bit tough. Don’t have a pressure cooker? 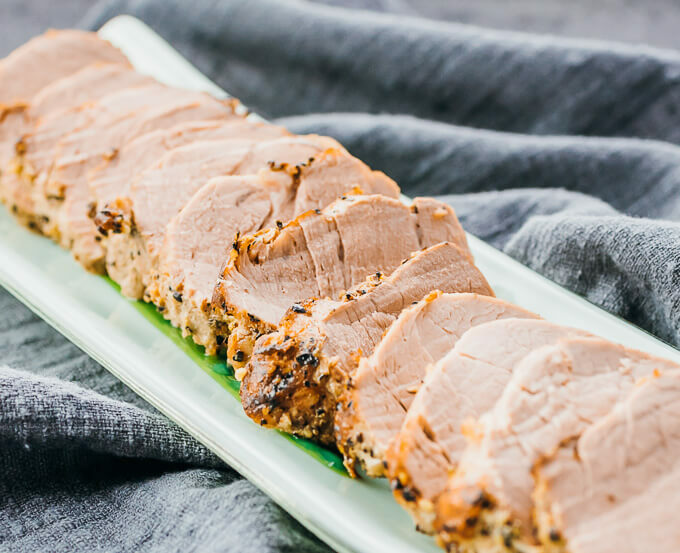 Check out my roasted pork tenderloin recipe. Cut the pork tenderloin in half so it’s half as long as before. If unseasoned, season all sides with salt and pepper. Turn on the pressure cooker’s saute mode for medium heat. When the display reads HOT, add olive oil to coat the bottom of the pot. Add pork and cook until golden brown on one side, about 5 minutes. Flip to cook the other side for a few minutes. Transfer the pork to a plate. Add onions and cook for a few minutes, stirring frequently. Turn off the saute mode. Add water, stirring and briefly scraping up any brown bits stuck to the bottom of the pot. Return the pork to the pot, nestling it on top of the onions. Secure and seal the lid. Cook at high pressure for 4 minutes, followed by a 10 minute natural release. Make sure to wait the full 10 minutes; do not open even if the pressure is completely released before 10 minutes have elapsed. Uncover and insert a thermometer into the thickest part of the tenderloin -- it should read 140-145 F. Transfer the pork to a cutting board and let it rest, where it will continue cooking. Do not slice yet. Turn on the saute mode. Add heavy cream and mustard to the pot, stirring together. Bring to a boil. Let the sauce boil for 8-10 minutes to thicken, stirring frequently. Turn off the saute mode and stir for a minute to let the boiling subside. Stir in parmesan cheese until melted. Slice the pork into thin slices and serve onto plates. Pour the sauce on top. Super easy and delish. The family loved it. if you add two pork tenderloins do you also double to cook time? The pressure cooking time remains the same. What do you recommend for cooking time if the pork is frozen?? I made this without the sauce when I was in a big hurry. Made quinoa in the broth left after cooking the pork. I reheated the leftover pork on top of the quinoa by steaming in the IP, 3/4 cup of water, set on steam for 0 minutes, natural release. Worked great. hi there! 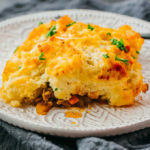 I am making this tonight and am so excited! This will be my 2nd Insta pot recipe. However, I do have a question. How would you incorporate veggies or potatoes into this recipe? I am trying to use this pot only rather than roast carrots and potatoes. Any suggestions? Should I remove the mustard sauce and then cook the veggies? I would cook the veggies separately because the pot’s contents are used to make the sauce. It also really depends on the particular vegetable, since diff veggies cook at different rates, which is another reason why I recommend cooking them separately. Delicious! Made with regular boneless pork chops and it was delish! Could you do 3lbs of tenderloin? Would the cooking times change? You can increase the amount of tenderloin used, just make sure you increase the other ingredients proportionally as well. Also make sure that the tenderloin(s) are cut so that each piece is no more than about 1/2 to 3/4 lb. Keep the pressure cooking time the same. 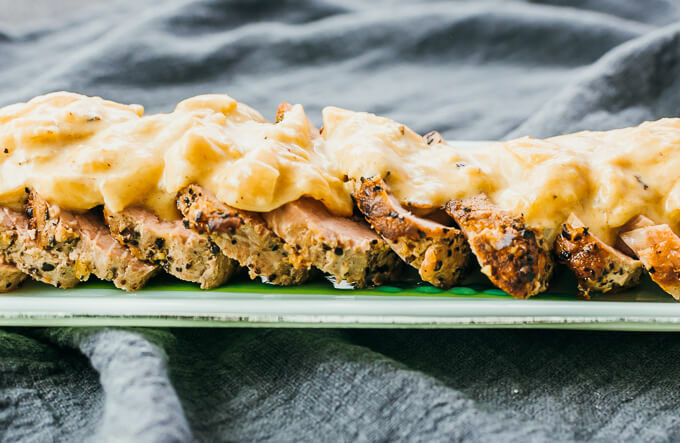 This pork tenderloin is so delicious that I would like to make it for company. Julia, do you have any advice on the best way to increase the recipe to serve 8? Hi Heather! You can double or triple the ingredients as needed to serve 8. For the saute part in Step 2, you may need to saute the tenderloins in batches because they won’t all fit simultaneously. For the pressure cooking part in Step 5, you shouldn’t need to change the cooking time. Make sure the tenderloins are evenly spread out in the pot. For the sauce thickening part in Step 7, it’s possible that you’ll need to increase the boiling time by a bit, until it’s thick enough to your liking. Hope that helps! Yes, makes sense. Thanks so much, Julia. Meat was also over cooked, but whoa – the sauce! I added a good 1/4 cup of white cooking wine to deglaze the pan before the onions went in, and I also added a healthy teaspoon of country Dijon along with the regular Dijon. Tenderloin was well seasoned with garlic powder, pepper and Himalayan salt. Great, thanks for the feedback!! I’ve never tried country dijon before, I’ll have to look into that. Need confirmation… I assumed that we weren’t supposed to discard the remaining liquid before making the dijon sauce. It turned out pretty good the way I did it — just wanted to verify that that’s what is intended with this recipe. The pork was wonderfully tender and juicy. I added a little garlic powder, onion powder, and I used coarse kosher salt. I also used chicken stock instead of water. Like another commenter, I also forgot the parmesan cheese and I liked it enough without it, that I think that’s the way I’ll do it in the future. Thank you so much for the response! 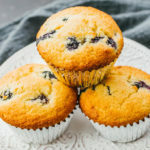 This recipe is so delish! My family loved it!!!! This recipe will definitely be one of my favorite. I made this tonight and it was great! I used turkey tenderloin, because it was on sale, but cooked as instructed and everything came out great. I just realized I forgot to add the cheese to the sauce, but it was still really good without. Might even omit it next time, too! This was my first recipe in my pot, besides white rice, and I really appreciated the step by step guide. Thanks! This was so tasty! It took me about 40 min start to finish. When I took out the pork, the temp was really high, around 175. I followed the recipe exactly, so not sure why. But the pork was still really juicy so it didn’t seem to be a problem. I had the exact same issue with the temp. Did you weigh the pork tenderloin? Perhaps yours is smaller than what I usually use and therefore cooks more quickly. Mine is usually between 1 and 1.5 pounds. Hope it still came out well and tasted great! Likewise with the very high temp (around 170F), both times I’ve made this recipe. I have an 8qt Instant Pot and I’m using a 1.5lb tenderloin each time. I’m a little worried that I’m overcooking the tenderloin because of the high temp. Not all of it is very tender – the ends are a little tough. Should we cut the cook time or the natural release time? 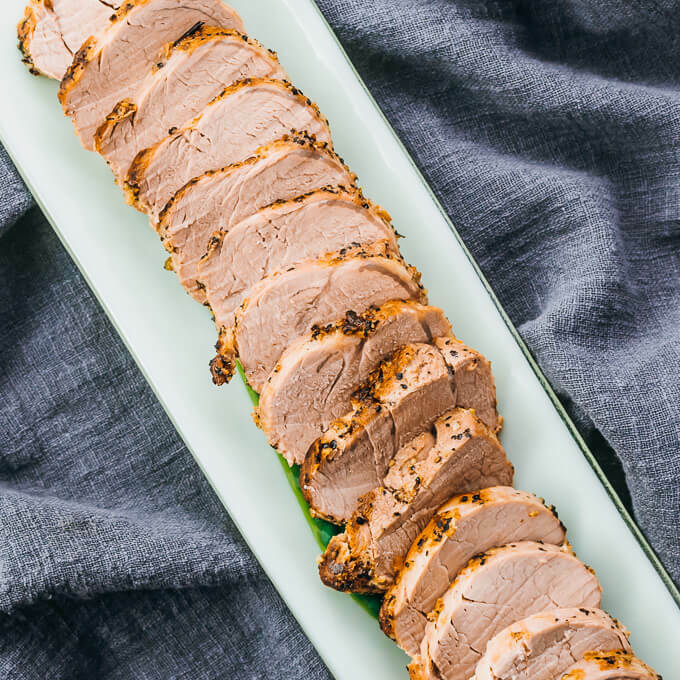 That said, the flavor of the sauce is a total crowd-pleaser in our household, and this is our go-to recipe for pork tenderloin. For reference, I use a 6 quart Instant Pot. 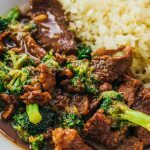 You can either cut the pressure cooking time by 1 minute, or reduce the natural release period by 5 minutes. In my experiments, such changes had resulted in an undercooked tenderloin, but since yours is always overcooked, it should help with getting the final temperature closer to 140-145. Do you cancel from auto warm during natural release? During natural release, I do not press cancel from auto warm. Once the pressure cooking is done, I don’t touch any buttons until the 10 minutes are up. Do you think this would work with Stone Ground Mustard and a different cheese? Could you suggest a cheese? Hi Sheri! You can replace the parmesan with asiago cheese. Make sure it’s very finely grated so that it melts easily. I haven’t tried using stone ground mustard but I think it’ll work fine. Let me know if you have any other questions! Very timely as I have a two pack of two each from Sam’s. Thank you. If I made two tenderloins, or even all four, would the timing remain the same? Thank you! I haven’t tried doubling this recipe’s ingredients, but if you do, you should follow the cooking times as listed in the recipe. So the timing would remain the same. You likely won’t be able to saute the tenderloins at the same time because they won’t fit, so work in batches. 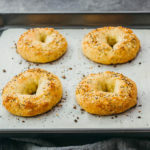 So, do you prefer this method over baked? We love the baked and the time diff doesn’t seem like it’s worth it? Can you tell a difference in flavor or tenderness of the pork. No, I can’t tell a difference in the flavor or tenderness of the pork, so if you like the baked method, I would stick with it. 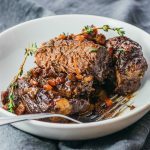 I like using the Instant Pot method when I don’t want to bother with the oven and stove.